Want to buy industrial property? Want to sell your industrial property? You’ve come to the right place for either the Selling or Buying of Industrial Property in Cape Town, South Africa. The Sale and Rent of Industrial Property in the Western Cape are the primary focus of Epping Property. Passionate about the industrial property market, our strengths lie in the sale and rent of properties – utilising our market knowledge to find you the best deals. Importantly, our team of experts boast years of experience, providing access to skills that most unspecialised brokerages cannot offer. Our background lies in handling the buying and selling of property for some of SA’s largest property investors. Learn from the professional investors! With feet firmly on the ground, our team is ready to respond to your inquiries quickly and efficiently. Our business areas include Airport Industria, Ndabeni, Maitland, Epping (1 & 2), Beaconvale, Parow Industria and Bellville (Sacks Circle), as well as the R300 strip –the major industrial zones of the Cape Town area. Most notably, while we handle all areas of Cape Town, our primary focus remains on the central industrial areas. As Epping is the heart of industrial property in Cape Town, it only fits that this is where we have made our home. Owning industrial property that increases in value can be a great investment for entrepreneurs that want to diversify or sell in the future. Operating a business from your own premises gives you peace of mind knowing that you do not have to worry about lease renewals and hefty rental increases. Should the business grow and require additional space, there is an option to renovate or extend the building. Financing commercial property eventually becomes less expensive in the long term. Entrepreneurs have an option to refinance the property should they require additional capital to grow the business. There is an option to sublet a portion of the building and earn additional revenue. Epping Property offers invaluable advice and analysis on sale and rent considerations. Also, we are mindful that every company focuses on different factors, evaluating every opportunity in their unique way when comparing to the business and enterprise concerned. We see ourselves as an integral part of the Epping business community and work in close collaboration with all stakeholders. Including the Epping Community Improvement District. We assist in making sure the suburb gets closer to achieving its potential. In addition, Epping Property offers invaluable advice and analysis on Sale and Leaseback considerations. We are mindful that every company has different factors and evaluate each opportunity in a manner unique to the business and enterprise concerned. 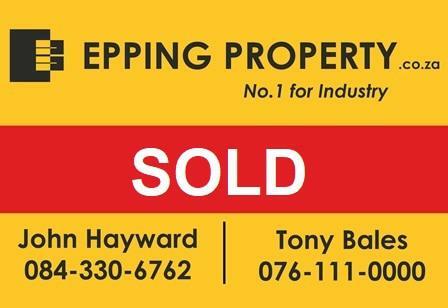 Epping Property’s holding company, Bales and Associates, specialises in the sale and leasing of commercial, retail and leisure property. 28 Thor Circle, Thornton. Sold to a private investor for R5,5m. Ex DairyBelle sites in Cochrane Ave, Epping 1. Sold to an Owner Occupier for R66m. 14 Cochrane Avenue Epping 1. Sold to an Owner Occupier for R32m. Inyoni Park, Ndabeni. Sold to an investor for R30m. 33 Packer Ave, Epping 2. Sold to an Owner Occupier for R3,6m. 45 Morningside Road, Ndabeni, Cape Town. Sold to an investor for R20m. Unit 5, Trippessa Park, Bofors Circle. Sold to an Owner Occupier for R2,80m. Corner Mail and Techno Crescent, WP Park. Sold to an investor for R5,05m. 22 Bertie Avenue, Epping 2. Sold to an Owner Occupier for R18,75m. 8 Hawkins Ave, Epping 1. Sold to an Owner Occupier for R11,2m. 6 Nourse Ave, Epping 2. Sold to a private investor for R6m. We spend most of our time in Epping and the major Industrial regions of Cape Town. Our local office enables us to better serve our clients in a variety ways. Click here for a comprehensive Property Purchase Checklist.